As head of the Department of Environmental Conservation’s Division of Mineral Resources, Bradley J. Field is a prominent figure in an agency that has promoted hydraulic fracturing as a risk-free and impeccably regulated technology with a proven track record in New York. Many will argue, to the contrary, that certain flags go up when a public official who plays a critical role in developing policy on the future of petroleum extraction embraces an ideologically loaded position such as global warming denial. Questions about Field’s pro-industry stance on global warming come as the DEC faces accusations from environmental activists that the agency gave the natural gas industry exclusive and unfair access to draft drilling regulations up to six weeks before they were released to the public or to any other stakeholders. Gas industry representatives purportedly took advantage of this inside information by lobbying to minimize reporting requirements designed to regulate toxic and radioactive runoff from drilling sites. These allegations and other issues will be the focus of a Senate Democratic Conference forum July 18 in New York City, spearheaded by Senator Tony Avella and other elected officials calling for stricter scrutiny of the DEC’s relationship with the oil and gas industry. Oil and Gas development has been taking place in our state since the 1800s. Laws and regulations have been in place to regulate the industry so that property ground water resources are protected. Casing programs are designed to isolate the shallow drinking water from the deeper formations that may be fraced [sic]. The Marcellus Shale is approximately 6,000 feet in Sullivan County, over one mile deeper than drinking water zones. Industry has used horizontal well drilling in New York since the late 1980s. Hydraulic fracturing has been commonly and safely used in New York state for decades. Marcellus Shale fracing operations use fresh water, sand, nitrogen and a diluted soapy solution to fracture the shale. These frac [sic] fluids do not contain benzene, toluene or xylene … The industry is regulated, and the lack of contamination events is evidence that the laws and rules are effectively protecting the environment. The memo echoes reassurances made by longtime Mineral Resources staffers Jack Dahl and Linda Colhart (documented in pages 64-67 of Under the Surface, Fracking, Fortunes and the Fate of the Marcellus Shale) at town forums when residents were first learning they were sitting over one of the largest natural gas fields in the world, and companies were ready to pay big money for the rights to develop it. The prevailing message -- don’t worry, we have it covered -- raises the question: Is this a sufficient level of vigilance from an agency responsible for overseeing the world’s most powerful industry, setting up shop on millions of acres of other people’s land, and exempt from federal and state disclosure and hazardous waste laws? Contrary to Field’s reassurances, we now know operators have never used fracking with horizontal drilling in New York state, nor have they ever developed shale gas reserves in New York state; fracking employs hundreds of toxic and caustic agents; cement casings fail at least 6 percent of the time and more as they age. 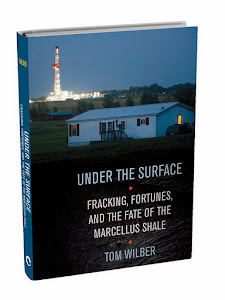 Many of these revelations came to light in the public critique of a review of the environmental impacts of shale gas development ordered by Governor David Paterson in 2008. The 1,500-page document, called the Supplemental Generic Environmental Impact Statement (SGEIS), gives an assessment of environmental risks (mandated by the governor’s order) of high volume hydraulic fracking that was absent in earlier public presentations by Mineral Resources staff. These risks include depletion of water resources, water pollution from spills, and hazards related to methane migration – caused when drilling opens new pathways for natural gas to move through the ground into enclosed spaces and water wells. Permitting guidelines will be based on this review, which fell by natural selection to the DEC’s Mineral Resources Division. The SGEIS is now under its third draft after a series of intensive public hearings drew more than 70,000 comments critiquing earlier versions that were generally praised by the industry but deemed too weak by critics. The next and final version of the document is expected this summer. It’s true that New York state operators have used fracking to develop conventional wells – a minor undertaking in terms of scope and impact compared to shale gas development. But even here there are all sorts of inconsistencies between the Mineral Resources Division’s position and the record. There are instances where conventional drilling has caused water pollution, but these are obscured by lack of reporting requirements and enforcement. When claims of water contamination are reported, the DEC Mineral Resources Division, the lead investigative agency, often leaves it up to the industry to settle with property owners who face a high burden of proof and experienced industry legal teams. Such was the case with Dave Eddy, who lived with his wife and two small children in Allegany County, near a non-Marcellus drilling operation by U.S. Energy Development Corporation. When workers began fracking the well in 2009, the Eddy’s bath faucet, which at the time was filling the tub for the kids, produced a foamy, chocolate-brown stream. Testing by the company found the well was polluted with petroleum, according to a letter to the DEC from Jerry Jones, operations manager at U.S. Energy. The company subsequently installed a filter on the home, put the family up in a hotel and offered compensation for the pollution, the letter states. It was the beginning of a protracted and frustrating legal battle with the company. The lack of accountability has caused nagging public relations problems for the industry and those who oversee it, not just in New York. Tom Ridge, the former Pennsylvania governor, national homeland security director, and paid industry spokesman, told AP reporter Michael Rubinkam last year that energy companies need to do a better job reassuring citizens that they take environmental protection seriously, in Ridge’s words “…. to be concerned about their public image and … to understand what they need to do to improve it." This very issue came up last week in a post by blogger Andrew Revkin, of New York Times Dot Earth. The post featured the perspective of Auden Schendler, who is vice president of sustainability at the Aspen Skiing Company and author of Getting Green Done: Hard Truths from the Front Lines of the Sustainability Revolution. In Revkin’s post, Schendler reported on many things – namely a project to capture methane waste from a coalmine to power the ski resort. But he had this to say about fracking. So when will the industry regain control of the message? The discussion now seems stuck on something people like to refer as “nonpartisan science” – which more often than not when used by industry and politicians is code for scientific analysis that supports certain views over others. The fracking debate has become loaded with this kind of science, a fact that shows us, perhaps more than anything, that shale gas development has not been around long enough to generate much in the way of a conclusive body of knowledge and scientific consensus regarding its long-term health and environmental impacts. (Here for example, are opposing studies regarding the global warming effects of shale gas development, one by Robert Howarth and one by Lawrence M. Cathles.) These early studies, in truth, mark the beginning of a long and necessary scientific inquiry. In the meantime, it’s way too early for people to begin closing their minds. So is Bradley Field, the petroleum engineer and drilling proponent who can’t remember if he is a climate change denier; the holder of a singularly influential position to determine the outcome of shale gas development in New York state as the issuer of permits and the overseer of regulations -- Is this Bradley Field nonpartisan? It’s a relevant question. Elected officials come and go. (Field has already served under five governors.) The policy being derived under Field’s long and unchallenged tenure with the DEC will be enduring. Correction: The original version of this post inoorrectly cited authorship of the Metroland article, Field of Distortions, to William Boyle. Climate change denier: like a Holocaust Denier? Does fields actually deny the climate changes? Or does he deny manmade climate change? "“no convincing evidence” that manmade greenhouse gases will disrupt the earth’s climate." So from manmade greenhouse gases don't disrupt to Climate Holocaust Denier. Pardon me if I got in the spirit of things and made the next leap in escalating rhetoric. I can't imagine why the Gentleman doesn't want to provide more plowshares to be beaten into swords against him. You're not objective, and this isn't fair reporting. It's advocacy journalism. I admit, I advocate fracking for upstate NY. Then again if I was marooned there instead of being part of the diaspora I'd be advocating secession or revolution. But I admit it. Thanks for the comment. I agree with you, this is about disclosure. There is no dispute that the earth has been warming since the last ice age (except perhaps by evolution deniers). The relevant discussion is how fast, and what are the consequences of human contributions as a catalyst? Field is one who denies that human CO2 contributions are bad. He's entitled to that view. But why is it that he can't remember... ? This is really a story about trust and government oversight. You are correct. I am an advocate, too -- for transparency and full disclosure. Here’s more on that. DEC spokeswoman Emily DeSantis responded: "We do not promote HVHF as risk free and certainly have not under this administration." You're wondering why the frackers are not making efforts to maintain their public image. It's because they're fly-by-nighters. The business model is to buy gas rights, drill, frack, announce large first-year production, and then *sell* to the oil majors. This isn't secret, it's published in their annual reports. The majors are actually the target of a scam here, because there's a lot less gas than advertised, as the USGS figured out. It's important to understand this in order to understand the psychology here. The majors want to protect their image -- the fly-by-nighters who do HVHF don't think the same way, they think "we'll be gone in two years, on to the next mark".